The ultimate accessory for any head or head of hair! The possiblilities are endless; call us with your fav flowers and colors. Shown on a clip are beautiful lilies with fairy grass accent. 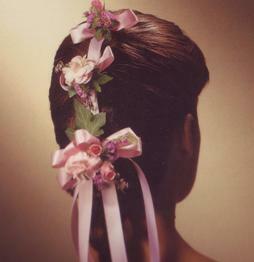 Prices vary from 25. to 75. for hair flowers. They can be made from a few blooms to a complete headband. As shown with flowers and size, 55. SKU: d1f255a373a3 Category: Corsages and..